On June 29, 1776, Father Francisco Palou, a member of the Anza Expedition, has a brushwood shelter built here on the edge of a now vanished lake, Lago de los Dolores (Lake of the Sorrows) and offered the first mass. 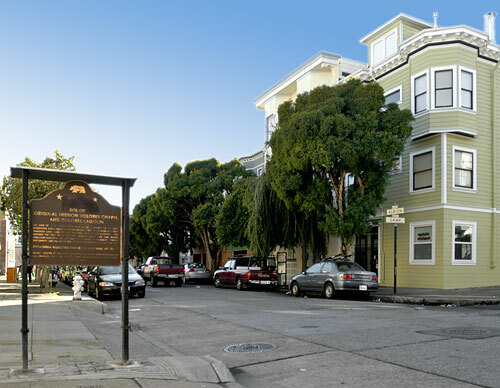 The mission was a log and thatch structure dedicated on October 9, 1776 when the necessary church documents arrived. 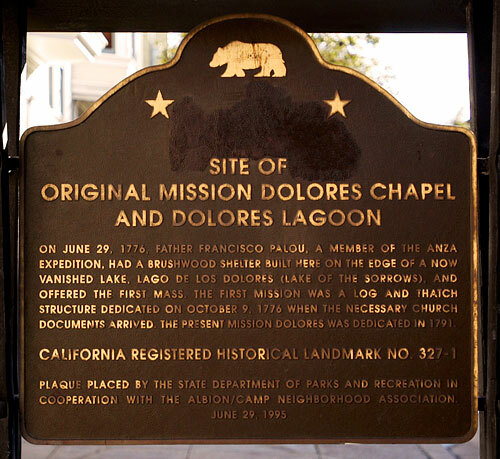 The present Mission Dolores was dedicated in 1791. Plaque placed by the State Department of Parks and Recreation in cooperation with the Albion Neighborhood Association, June 29, 1995.